Forecast Dividend Dogs of the FTSE is a high yield income strategy inspired by the popular 'Dogs of the Dow' approach of US investor Michael O'Higgins, who wrote Beating the Dow. It simply selects the 10 highest yielding stocks in a major market index like the FTSE 100, the S&P 500 or the FTSE Eurofirst 300. This version of the strategy uses the rolling 1-year forecast yield. It's main safety net is that blue chip stocks tend to be large, mature and well financed companies with long histories of weathering economic turmoil. 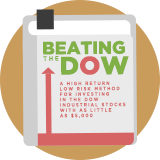 O'Higgins wrote: "Beating the Dow is based on simple logic that will produce exceptional returns in any rational market and until excessive popularity turns contrarianism into conventional wisdom." O'Higgins suggested rebalancing the Dividend Dogs portfolio once per year, based on the highest yields available. Considered one of the top money managers in the US. CEO of O'Higgins Asset Management. Author of 'Dogs of the Dow'. A US version of this strategy - The Dogs of the Dow - was popularized by Michael B. O'Higgins, in 1991 who proposed that an investor annually select for investment the ten Dow Jones Industrial Average stocks whose dividend is the highest fraction of their price.